The Complete Blueprint To Attract All The New Patients That You Need, Transform Your Website And Direct Marketing – And Increase Your Clinic”s Profits By 50% To 250% In The Next 12 Months – Guaranteed, And Done With You Inside 6 Weeks! Get Instant Access To Module 1, TODAY! Yes! I want to start this course NOW! Before I tell you what the “6 WEEK NEW PATIENT ACCELERATOR” Method actually is, first…. …Let Me Tell You What It ISN’T. With all of the changes in the Industry, most PTs accept they must head in a different direction if they’re to be successful in the new health care economy. So, what you won’t find on this course is outdated strategies for marketing to doctors or sending time consuming newsletters to past patients. These days, most PTs can’t even get their newsletters read… let alone their head through the door of a new doctors office… and many agree that time and effort is now better spent doing something much more effective – like Marketing directly to consumers. And while there are many Marketing courses that simply “re-hash” what other people teach, what makes this course so wildly different is that I make this stuff work at my own practice FIRST, and then I pass it on to you. This is the 7th time I’ve released this Masterclass program. Each time previously, it has sold out completely. The reason it does sell out every time? Because what you will find here is, quite simply, the MARKETING SYSTEMS that’ll let you take advantage of the new opportunity to grow a more profitable “Cash”, “Hybrid” “OON” or “In-Network” Physical Therapy clinic - without needing any referrals from doctors. If you want more patients from “Direct Access” – this program will do that for you. And, for many PTs who are already using the Accelerator Method, that new way of growing a business has already become a reality. "I made all the money back that I spent on investing in Accelerator, within 3 weeks - and my numbers continue to increase. It's the best money I've ever spent on my business, no questions asked." "Since taking Accelerator my monthly revenue has increased by 60%. I was seeing 7 patients a week and now I'm at maximum capacity." "My monthly revenue has increased 10x since taking Accelerator, and I continue to be more and more profitable every month since." So, it's clear that PTs like you want the latest marketing strategies turned into new patient acquisition SYSTEMS that'll set you up to win in the new health care economy - and not just for next week, but for the entirety of your business. ...those types of strategies are now dying if not already dead! Make no mistake - in the new health care economy, it’s all about creating New Patient Acquisition Systems so that your business can thrive without referrals from any physicians, systems that'll let your PT clinic grow without you, and systems that’ll let you prosper even you have little or no marketing skills. So, What Is This New Opportunity For Smaller Clinics Who Can’t Get Referrals From Doctors? In a study (by “Fritz and Childs”) it was revealed that just 7% of people who visit their doctor with low-back pain are being given a referral to a Physical Therapy clinic - DESPITE the evidence suggesting that the cost of care AND recovery time for the patient is less. Those numbers are shockingly low - and also explains why so many PT’s are failing to make the profits they deserve. Because when you can answer THAT question, your clinic's success is all but guaranteed! Essentially, what they’re all doing is “fighting over the crumbs” - and it’s no wonder why so many PT’s are not getting the referrals from doctors they need to survive. …you just have to do something different than you are now with your Marketing! What about ALL the people with neck pain, knee pain, pelvic floor, or sports injuries? (They’re also being overlooked for PT by their Doctor). So, when you add all of these people up – it’s easy to see that there’s a massive amount of people – it could literally be in the 10,000’s in your small town alone who are NOT getting the help they need simply because they don’t know you exist - yet. I call these patients the “OVERLOOKED” - and while all of your competition is fighting for the “7%”, what you and I have to do is MARKET directly to this massive overlooked and UNDERSERVED pocket of people. If you do, then please read on. This is YOUR opportunity – and this is where you need to FOCUS on if you want your clinic to SOAR like it could. And that’s why if you switch your focus to being noticed by the other 93% - your chances of success increase dramatically. Clinic owners like Dr. Jarod Carter, Aaron LeBauer, Andrew Vertson, Mike Reinold and Jerry Durham have hugely successful cash-pay, INN and OON clinics – and that’s because they’ve followed the Accelerator Methodology and set themselves up to Market to the “93%” currently being overlooked for PT. I speak to GREAT PHYSICAL THERAPISTS like you on a daily basis, and I know that you’re frustrated at not being given a chance by doctors… having doors closed for no reason… by competition from other health care providers with less legislation… insurance company billing headaches and fees being slashed... big hospital systems with huge ad budgets… and all this made INEVITABLE by having gone right through "PT School" without ever covering the most important skill of all – Acquiring New Patients. But the good news is this: as the health care changes sweep in across the US and around the world, it’s levelled the playing field for a new type of Clinic Owner - “PT Entrepreneurs”- eager to do what ever it takes to WIN, fully able to prosper independently without knowing any doctors, running clinics from any type of space, with little if any insurance headaches. The answer is simple…. by MASTERING the science and skill of Attracting New Patients directly to your practice. And it’s for that reason – to give more clinic owners that very opportunity - why I created the “6 Week New Patient Accelerator” program. It is also the same reason why so many PTs have already invested in this New Patient Acquisition Master Class. So What Is the New Patient Accelerator Method? 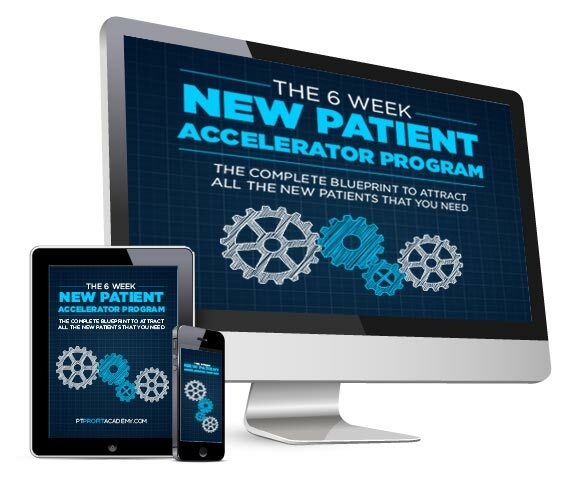 Quite simply, ‘6 Week New Patient Accelerator” is the Ultimate Physical Therapy Marketing course and is one of the most powerful experiences that you and your Physical Therapy business will ever have. The core part of this Ultimate Marketing program is a 6 part, in depth Video Seminar program. Each of the 6, 90 minutes Video Seminars is packed with profit strategies to take your PT business to the next level. On your 6 Video Seminars, you will experience dozens of leading edge strategies to impact the number of patients you attract and the profits you generate. From attracting new patients, to creating Advertising that works, having a powerful and effective website, getting free PR coverage in the media, using new Marketing approaches such as Pay per Click - and much more, this is your complete guide to Physical Therapy Marketing and Business success. The 6 weeks are packed with powerful information that you can use immediately to increase your profits, attract more patients and grow your business – whatever your business - In Network or Cash based - and whatever its size. You can access the Seminars from the comfort of your home or office, on your computer, laptop or mobile. This program is not just about me delivering powerful information to you to help you grow your business. I also want to offer you personal, ongoing support, accountability and Coaching. If a question comes up for you between the seminars, post your ­question on the forum and I will personally answer it. This personalized support is an important part of the program (nobody else has this type of personal ­access to me.) Just as importantly, you get to interact and support everyone else on the Program. New Patient Accelerator gets down to profit boosting strategies so quickly that you will want to block out extra space in your schedule immediately after our meetings so that you can make these simple, but big changes to your clinic’s marketing. There’s something on this course for every type of PT Owner – In-Network, Hybrid, Cash – and in reality, because of the profit windfalls you will make, it will not cost you a single penny to take this 6 week Marketing Master Class. You are fed up with hearing “I’ll think about it” - when the cash-pay conversation comes up! You are angry at being 'BATTERED' by insurance companies and the pittance they pay you.. If you run a well established or growing PT business, these 6 Video Seminars will give you the most effective, proven and current strategies in the world to help you grow that business quicker. Most PT businesses are Marketing at less than 30% of their capacity. This is a shocking waste. It means that you could be losing a fortune in untapped profits every month from new patients who are not coming to see you – but should be. Because we are so close to our businesses, it can sometimes be a challenge to see the potential that often lies right in front of us. On Accelerator 3.0, you will uncover virtual goldmines of opportunities in your clinic’s marketing giving both you and your PT business a great deal more financial freedom – and time. If you are just starting a new PT Business – especially a “cash based” or “hybrid” one - then this Marketing Mastery course is ESSENTIAL for you. Not only will you discover how to avoid the costly mistakes that lose many start-up businesses a fortune in wasted Marketing efforts, but you'll also be launching your new PT business with the most powerful, proven and effective Marketing strategies that the PT industry has ever seen. Don't leave it too late like so many other PT business owners do… and please DO NOT risk opening your new business thinking that you’ll be able to rely upon referrals from local doctors – that referral source is no longer a credible option for new Owners like you. Now is the time to Master world class Marketing and business success skills for your new venture – and very quickly eclipse your bigger competitors still stuck using old fashioned, out dated, “dinosaur” age methods for marketing their clinic that don’t work like they used to. On your first video seminar we’ll be mastering the 3 absolute golden rules of Marketing that will create the foundation for all of your future business success. The major reason you’re not getting the number of patients you want - For both In-Network and Cash clinics… this is the single biggest mistake that is probably costing you a fortune in wasted ads and lost patients. What you’ll master on this video seminar is quite simply, one of THE fastest ways to boost your clinic’s profits – conversions... how to get more patients on schedule from ANY referral source. We’ve all experienced this: patients referred by a doctor, a workers comp, or direct access client who makes an “inquiry” about your services… but for some reason will still stall over coming to see you. This is an internal marketing problem and I have an easy to copy system for converting more of your inquiries to full paying patients - no matter what excuse they have, or what referral source they come from. Cash-based owner? Never again suffer the frustration – and profit loss - of patients choosing the in-network hospital system across the street (We know it’s cheaper… but we also know you’re better!). Done right, Direct Mail can be the key to a goldmine of additional profits for your clinic. If you are growing a PT business, you will want to master this fundamental subject. In this seminar, I will show you how direct mail can play a vital role in your PT business success. Plus - one of the most overlooked and powerful marketing tools remains local Newspaper Advertising. If your business is not using local Newspaper Advertising effectively to acquire new patients, you are probably losing out on a small fortune. How to get the cost of all your ads DOWN… (Saving you the cost of this course alone) plus the words and phrases that can make the difference between direct mail success…or failure. Plus - unlike many of the outdated PT Marketing courses out there, this module will show you how to bring “old school” Marketing strategies like these into the 21st Century…We’ll feed you the exact steps to make sure that much of this happens systematically … and that most of your new patients arrive on autopilot. In the new health care economy, your Internet Marketing Strategy is an absolutely vital component of your clinic success. I’ll show you precisely what you need to do to attract an ongoing stream of visitors to your website and convert those visitors into paying patients, 24/7. We’ll have a special focus on Facebook Advertising, a great source of potential new Patients for you and we’ll look at everything from Native Advertising, to Remarketing and Pay Per Click Advertising on Google - the most important Marketing breakthrough this century. Pay Per Click advertising is quite simply the most effective method for getting highly qualified potential patients to your website. But many who try Pay Per Click get their fingers burned - it’s essential that you understand the secrets of effective Pay Per Click marketing before you try it on your own. And much, much more… this truly is ground breaking information for ALL PT clinic owners… the new patient pay offs you will receive just for paying attention to this module could, quite literally, turn your business around overnight. What’s more, there’ll be no excuse for not using any of these Internet Marketing secrets… because you can have all of my ads, templates and exact landing pages making your success inevitable. What sets great Physical Therapy businesses apart from the average ones online is their ability to convert web visitors to paying patients. The thing is… most in-network providers overlook this source of income… and yet for the cash based owners, there is nothing more important than what your website says about how good you are - and why you’re worth paying out of pocket for! If you’ve experienced the frustration of having people come to your website but not become patients, you are not alone. The average conversion rate online is just 1%. The most successful PT business owners we work with are converting visitors at 15% to 30%. This Seminar will transform everything you do online as you master the secrets of effective and profitable website conversion. You can see why “word-of-mouth” for this Marketing Master Class program is spreading like wildfire. Wouldn’t you love to guarantee yourself a lifetime of marketing and PT business success? And finally know how to get more patients coming to you than you’ll ever need? A key goal for you and I working together on this program is for you to achieve ‘Price Freedom’. What is Price Freedom? It’s the ability for you to charge the prices you want, the prices you deserve, without losing patients. If you’re a “cash” owner, you simply cannot build the business you desire if you’re constantly being beat up over price… and if you’re an “IN NETWORK” provider, it’s vital you know more about Price Strategy so that you can make higher profits on any patients who want to pay out of network. I will show you how to establish a Premium Pricing Strategy, where you’re not only charging more than the competition, but your patients are more than happy to buy at those prices. This is one of the most powerful seminars - you may be surprised at how easy it is to charge more and you’ll soon discover that raising prices is only one way to command premium pricing. 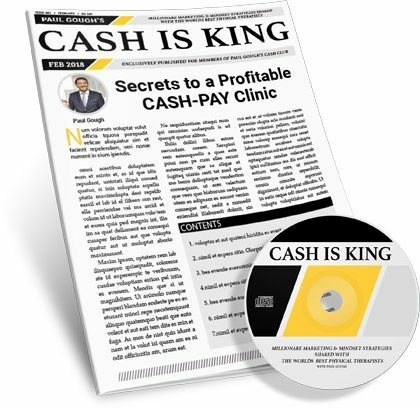 Plus, I’ll show you how to create a process in your business that means you can sell any cash service you want, to any patient you treat - at five to ten times what others are selling their cash pay services for. If insurance re-imbursement fees are being slashed in your State, knowing how to sell a cash pay service effectively could be the difference between profit and loss in your business in the next 12 months. What they are REALLY telling you when they say they can’t afford the copay or deductible – and how to ensure it doesn’t keep getting in the way of you having higher profits! “Price Elasticity” – what is it, HOW TO DO IT and why it makes sky-high prices at a cash PT clinic EASY to enforce. Insurance firms cutting your rates? Discover the secret rules for a successful “up sell” (This is how you will make more profit even if the insurance companies keep slashing your rates). I could go on - but I’m sure you realize by now this truly is a Marketing Master Class unlike anything ever seen before in the PT Industry. I think I’ll end by telling you that Accelerator is all about producing consistently reliable results… we don’t just want Marketing results “once in a while”… no, the hallmark of any great PT clinic is a concrete Marketing System that works consistently. That’s why the course – Accelerator – is designed to produce a measureable increase in the number of new patients for the entirety of your business. This Marketing program is designed to recoup your investment in Accelerator… BEFORE the Accelerator course even begins. The “7 Quick Fixes” program shows you 7 of the most simple ways to immediately boost your bottom line by compelling more cash paying patients to inquire about you online, to pick up the phone and call you, or to walk through your clinic doors. Get profit-boosting improvements to your clinic marketing that can make a big difference - starting TONIGHT. All 7 of these videos will be sent to you the minute you register your place on Accelerator. If you’ve ever taken a stall or a table at a community event…OR, given an “educational talk” at a local Pilates class, Yoga studio, business or gym…BUT came away frustrated at the LACK of new patients you got for your investment in time and money… then this “New Patients From Community Events” program will change all that for you. When you invest in “Accelerator” today, you’ll also get instant access to this amazing two-disc video program that’ll show you precisely how to acquire new patients from any and every event – using just one simple strategy that is easy to use and any PT can make work. Order Accelerator now, you’ll have this within minutes. 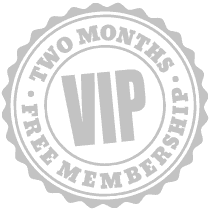 To ensure your success happens faster, you’ll also receive two months FREE access to my Next Level Group Coaching Program. This is an $1800 monthly subscription program where you can have UNRESTRICTED access to all of my best ads, you can join in additional weekly live event training calls, attend Monthly Marketing Master Class seminars, access the Facebook support community, get accountability and network with other likeminded PTs - including past Accelerator students - all using the same strategies for marketing glory as you. The coaching program is typically an $1800 per month investment… meaning you’ll be getting access to at least $3600 worth of additional Marketing tools, resources and support to ensure your success in Accelerator and beyond, is guaranteed and for FREE! You’ll be added to the group within hours of signing up. Note: The faster you sign up for Accelerator ...the quicker you’ll be added to the Group …meaning more Marketing success coming your way sooner! Take advantage today and get these New Patient Acquisition Systems working for your PT Business TODAY…and save $1600! You should expect your 6 weeks on this Marketing Master Class Program to completely change the direction of your PT business, website and internet marketing. This is for Physical Therapy business owners serious about achieving a 50% to 250% increase in profits across the course of the next 12 months. The full price of this program is $5000. But because you are on my “hot list”, you are getting a better offer than anyone else, at any time. This is your BEST (and most generous) opportunity to see what everyone is talking about. "Taking Accelerator has allowed me to raise my prices significantly which has had a huge impact on my profits, and I've been able to decrease the amount of patients I see, and still make the same amount of money." "My revenue has almost doubled since taking Accelerator, and I have a lot more time to work ON the business, not IN the business, and to spend with my family." Accelerator is 100% risk free for you to join. Here’s how my Personal Profitability Guarantee works. Take action today and join the “6 Week New Patient Accelerator” program… and if by the end of the second week you don’t think that Accelerator will get you the 3 extra patients you’ll need to cover your investment… I’ll gladly refund your money. All you need is just “3” new patients to cover your investment in “Accelerator” and in fact, with just 1 or 2 of these tactics, you could get 100 X your investment back and more! So, in reality, this course doesn’t “cost” anything. It’s essentially FREE… it’s an investment in your future wealth and prosperity. You can only grow your PT clinic in this new health care economy by attending this Marketing Master Class live event experience. Confirm your place today. Yes. If you’re new (less than 12 months old) Accelerator is perfect for you. We’ve had previous students who hadn’t even opened the doors on their clinic yet, but were preparing for it and wanted a kick start! Q I’m an in-network provider, is this relevant for me? Yes – especially if you want to move away from relying upon doctors for referrals. We usually find that out Accelerator students are split equally between in-network, cash and hybrid owners. You can ask them in the Facebook community and Paul will answer them for you instantly. Q What if I have a Marketing person? Can this person attend the calls too? Yes. You can have one key member of your team join the program with you free of charge. Paul Gough is a small business ICON-WINNER of the award for best in class lead nurture Marketing in 2016 selected across all of Infusionsoft’s 45,000 strong global customers and a former professional soccer Physical Therapist turned successful clinic owner from the UK. He is a published Author who has already grown his own physical therapy business from one clinic to four, and zero to $1m - in record time. What’s most impressive, is this: he’s done all that in a country with a completely free “socialist” health care system (that provides physical therapy services for FREE for all residents), as his main competitor. He is widely regarded in the US as a leading authority on Direct to consumer Marketing - and has a proven track record of helping physical therapists’ in the US to grow their practices, increase profits, free up their time and radically shift their Entrepreneurial thinking. He shows PT business owners how to win more patients and increase their profits using Advanced Marketing, Advertising and Internet Marketing Strategies. Every week, 1000’s of physical therapists receive his support and advice online, and his business success coaching programs are almost always FULL. “It’s really very simple. Most PT Owners spend over three hundred days each year struggling to run their business effectively and zero days mastering the marketing success skills that could transform your PT business performance. In response to the alarming DECREASE in the number of referrals from doctors that many PT owners are now experiencing, nation wide, I am inviting you to make the decision to spend 9 hours with me (6 x 90 minute sessions), from the comfort of your home or office, mastering this information that can make such a difference to your PT business and your profits - even your ability to survive and actually stay in business, as the big hospital systems move into town! P.S Here’s what even more PT owners are saying about how I have helped them attract all of the new patients they need, transformed their website and direct marketing… and gone a long way to helping them grow profits by 50-250%. When you make the decision to join Accelerator, I’ll be able to help do the same thing for you. “In just a few months of joining this program, we’re already getting to the point we don't have to do ANY physician marketing – thankfully, I am over that! Knowing what I know now, I would rather spend the time marketing directly to, and on the phone with potential patients, and NOT rude MA's, office coordinators, and cocky physicians.